I know you’re almost here & I am as excited about your arrival as you are. Hey guys, have you started preparing for the autumn? Well, I did. I started searching online websites for a/w clothes. One thing that excites me about this season of the year is Boots. These days, knee-length boots and denim boots are so much trendy and I was looking for something similar only. 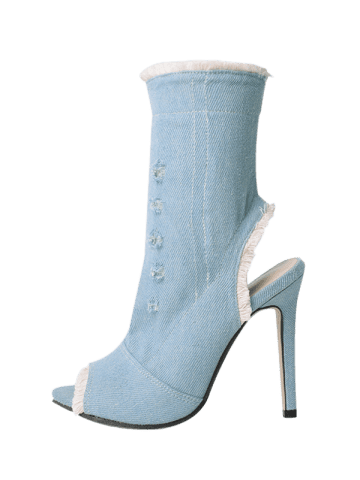 Luckily, I found Stiletto Heel Peep Toe Denim Boots on a website called Rosegal. RoseGal online shop offers you hundreds of styles of the best plus size, boho dresses, swimwear, rings, watches, jewelry, outerwear, shoes, bags and so on to choose from. Rosegal brand is full of trendy, chic and stylish outfits. Plus, women who are plus size will get ample of trendy products on their site too. I also chose Off The Shoulder Long Sleeve Floral Dress which is in black color. But I am little confused if the dress will go on me. Still, I would love to give it a try. What do you girls think about the dress? Would you like to own it or not? Do let me know your say in the comments below. Stiletto Heel Peep Toe Denim Boots Off The Shoulder Long Sleeve Floral Dress Do you want some new clothes, why not taking a look over here? Summer sales ongoing, all from 33% off. Use code RGEN for another 10% off! Time for a new outfit! I don’t wear the things that you show (ha ha), but they are very pretty. Please keep up your good work.